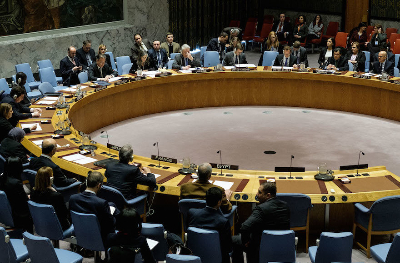 The UN Security Council has voted in favour of a resolution demanding the halt of settlement activity by Israel on occupied Palestinian territory with the United States notably abstaining. The resolution was put forward by New Zealand, Malaysia, Venezuela and Senegal after Egypt withdrew it under pressure from Israel and US president-elect Donald Trump. An angry Trump has promised “things will be different” after he takes charge. 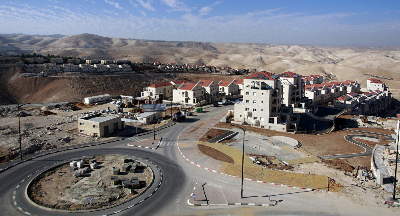 A United Nations resolution condemning Israeli settlements in the West Bank, put forward first by Egypt, called for Israel to stop building new settlements, which it said breached international law. It was to have been voted on in the UN Security Council, but Egypt requested the delay to allow time for consultations. 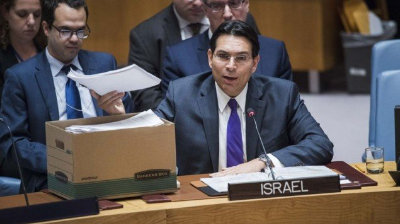 The United States, which holds a veto at the Security Council, has traditionally sheltered Israel from condemnatory resolutions by voting them down. But there had been speculation that the Obama administration might change that strategy in the president's final month in office and allow Egypt's resolution condemning Israel to pass by abstaining from voting in the Security Council.Israel then contacted Donald Trump's transition team to intervene, thus leading to Egypt withdrawing the resolution. The resolution was then introduced by New Zealand, Malaysia, Venezuela and Senegal on December 23, and the US abstained from the UN Security Council vote, refusing to use its veto and undermining its relationship with one of its historic allies. Israel and Trump had called on the Obama administration to veto the measure. Trump wrote on Twitter after the vote, "As to the U.N., things will be different after Jan. 20th," referring to the day he succeeds Obama. Why is Trump’s intervention not surprising? 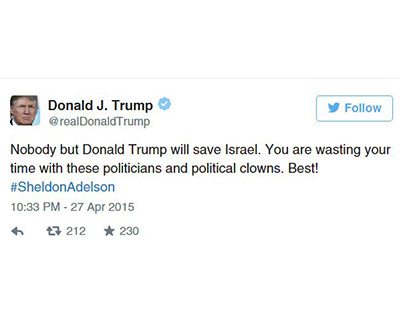 Trump is as pro-Israel as anyone can get. He had campaigned on a promise to recognise Jerusalem as Israel's capital and they intend to carry this out by moving the US embassy from Tel Aviv to Jerusalem. Israel and the Palestinians, who are seeking a state of their own, both claim Jerusalem as their capital. Successive U.S. administrations have said the city’s status must be “negotiated”. 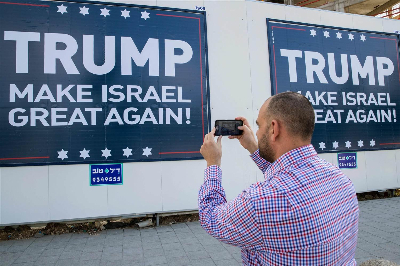 If Trump makes good on his campaign promise, it would overturn decades of U.S. policy and draw international condemnation.Jerusalem is home to sites sacred to Jews, Muslims and Christians. Jason Greenblatt, Trump's chief legal officer and executive vice president of the Trump Organization, who has been tapped as Trump's adviser on Israel, had commented on Israel's Army Radio that, in the next four years, there "would be a stark departure from the long-time American stance that Israeli construction in areas captured in the 1967 Six-Day War makes it more difficult to reach a peace agreement with the Palestinians". Thus, Trump would not pressure Israel to slow down settlement construction on Palestinian land. Further, he has chosen as ambassador to Israel the hardliner and settlement-supporting David Friedman, a man who has said Washington will not pressure Israel to curtail settlement building in the occupied West Bank. No one is expecting Israel to stop the construction in occupied territory just became UNSC asks it to. However, the vote is laden with symbolism against Israel’s aggression. It was the first time in nearly 40 years that the Security Council has passed a resolution critical of Israeli settlements. Although the standard US position has for three decades been that such settlements, which are built on land intended to be part of a future Palestinian state, are “obstacles to peace,” the United States has always stopped short of describing them as “illegal” under international law. When has the US played facilitator in key Israel-Palestine agreements? Since the end of World War II, the United States has been one of the leading nations to encourage, facilitate, and arbitrate cease-fire accords between Israelis and Palestinians. The United States has time and again employed its influence to utilize levers to persuade both parties that resuming peace negotiations are in their best interests. For instance, following U.S. victory in the Persian Gulf War, U.S. President George H.W. Bush and Soviet President Michael Gorbachev sponsored a peace conference in Madrid to address the conflict between Israel and Palestine.The conference in 1991 rejuvenated the Israeli-Palestinian negotiations. 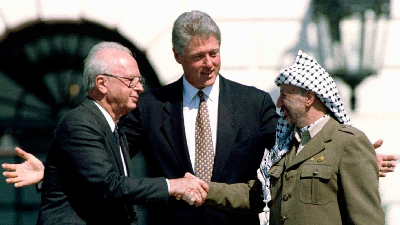 Over the next two years, the United States and other nations moderated discussions between Israeli and Palestinian leaders, and, in 1993, at the 11th round of peace talks, Israeli Foreign Minister Shimon Peres announced that Israel and the PLO reached a land-for-peace deal in Oslo. Under the so-called Oslo accords, Palestinian Authority Chairman Yasser Arafat recognized Israel’s right to exist and renounced the use of violence against the Jewish state. 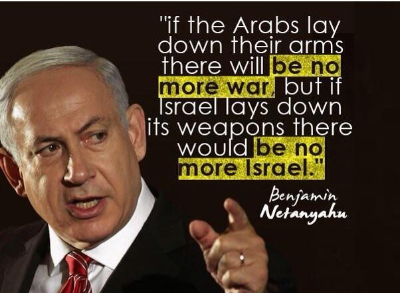 In return, Israel promised to allow for Palestinian self-rule in sections of the Gaza Strip and West Bank. Direct negotiations between Israel and the Palestinians were again restarted by the US in 2013 in an attempt to restart the peace process. The negotiations were scheduled to last up to nine months to reach a final status to the Palestinian-Israeli conflict by mid-2014. Negotiations started in Washington, DC and a deadline was set for establishing a broad outline for an agreement by 29 April 2014. On the expiry of the deadline, negotiations collapsed and haven’t been restarted again since. Historically the United States has vetoed dozens of Security Council resolutions on Israel and it is rare for it to abstain. The last time the Security Council adopted a resolution on Israel and the Palestinians was in January 2009, when Washington abstained on a resolution calling for ceasefire and withdrawal of Israeli forces from Gaza. In 1979 the United States abstained on a resolution, when the council said Israeli settlements “have no legal validity and constitute a serious obstruction to achieving a comprehensive, just and lasting peace in the Middle East.” Britain also abstained. Where are the reasons for the current stalemate in Israel-Palestine relations? Palestinians want an independent state in the West Bank, Gaza and East Jerusalem, areas Israel occupied in the 1967 war. Israel disagrees that settlements are illegal and says their final status should be determined in any future talks on Palestinian statehood. The last round of U.S.-led peace talks between the Israelis and Palestinians collapsed in 2014. The two sides' basic skepticism of each other's willingness and ability to make peace is the fundamental reason that the peace push led by US Secretary of State John Kerry fell apart in April 2014.Since then, the Palestinians have turned toward a pressure campaign designed to isolate Israel internationally and put pressure on the Israeli leadership to make peace. With Donald Trump set to assume US presidency, the pressure will be back on the Palestinians. As applause broke out in the 15-member Security Council’s chambers after the vote on the measure, which passed 14 to 0, with the United States ambassador, Samantha Power, raising her hand as the lone abstention, Israel’s ambassador, Danny Danon, denounced the measure, and castigated the council members who had approved it.“Would you ban the French from building in Paris ” he told them. Prime Minister Benjamin Netanyahu of Israel, who had scrambled in recent days to stop the measure from coming to a vote, issued a blistering denunciation afterward. Netanyahu immediately retaliated against two of the countries that sponsored the resolution.He ordered Israel’s ambassadors to New Zealand and Senegal to return home for consultations, cancelled a planned visit to Israel next month by Senegal’s foreign minister and cut off all aid programs to Senegal. Within the US, Donald Trump, who had urged the Obama administration to veto the resolution, has made clear that he will take a far more sympathetic approach to Israel when his administration assumes office on Jan. 20. How significant is the resolution that has been passed? Although the passage of the resolution changes nothing on the ground between Israel and the Palestinians and likely will be all but ignored by the incoming Trump administration, it was more than merely symbolic. It formally enshrined the international community’s disapproval of Israeli settlement building and could spur further Palestinian moves against Israel in international forums. Mahmoud Abbas, the Palestinian president, called it a “big blow to Israeli policy, a unanimous international condemnation of settlements, and a strong support for the two-state solution”. “The resolution is a significant step, demonstrating the Council’s much needed leadership and the international community’s collective efforts to reconfirm that the vision of two States is still achievable,” said United Nations Secretary-General’s spokesperson. However, Sharif Nashashibi, a London-based analyst of Arab political affairs, told Al Jazeera he feared the vote will be just one of many UN resolutions that Israel will flout. Before the vote a senior Israeli official said if adopted there was "zero chance" the Israeli government would abide by the measure. Under the UN Charter, UN member states "agree to accept and carry out the decisions of the Security Council".